Cometh the time, cometh the exploitable prejudice. With millions of globally displaced persons, states are retreating from the business of treating the condition as one of dysfunction inflicted by war, famine and poverty. It has morphed from a matter of humanitarianism to one of social ill and unease. The issue of fault has been shifted, to the individuals themselves, and their colluding agents, the people smugglers. What is salient now to the issue of state security is who has the best drawbridge, the most suitably booby trapped moats, and the least interested agent who might assess any worthy claims. If there is processing to be done, someone else is to take the tab. 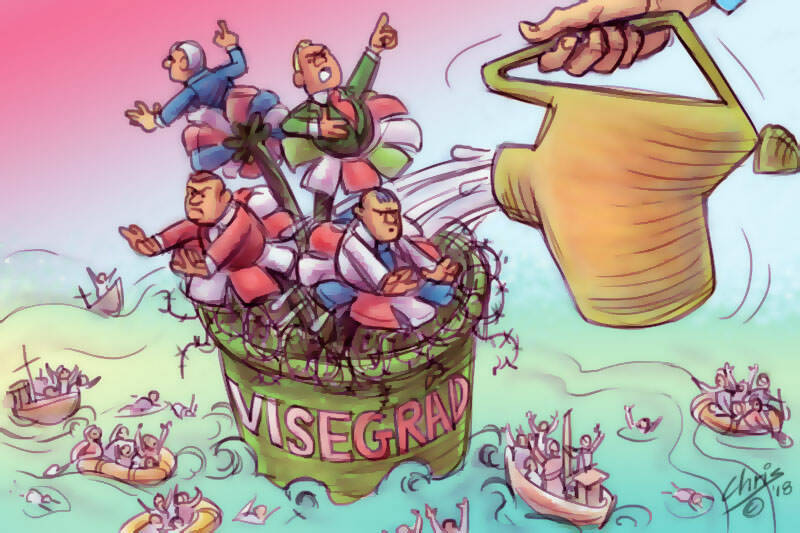 In Hungary, Victor Orbán has made it clear that he is holding some sort of blazing torch for European civilisation. The fact that the Avars were themselves fairly indifferent to dispossessing, plundering and marauding is simply too ironic for patriotic junkies like the Hungarian prime minister. In the visage of purity and values, he is leading the charge against refugees, drawing strength from his colleagues within the Visegrád group of states. The latest innovation from Budapest is legislation that targets organisations and individuals who help refugees through the provision of assistance. 'The primary aim of this legislation is to intimidate, by means of criminal law, those who fully legitimately assist asylum seekers or foreigners,' noted the Hungarian Helsinki Committee, a local human rights group. The sinister sting here is the punitive angle taken against the entire process of seeking asylum or refuge. In this, an air of inspiration is being drawn, notably, from the attempts of the Australian parliament to do the same. Refugees are to be repelled rather than processed, expelled rather than integrated. This notwithstanding that niggling ethical and legal point on whether a person facilitating the furtherance of a right might be punished for doing so. In Austria, refugees are becoming imperishable gold in political exploitation, with dark allusions to processing camps being made. Sebastian Kurz and Heinz-Christian Strache have been making the most of it, though they have also enlivened a protest group against them. Germany is also finding itself in the refugee tangle. Chancellor Angela Merkel is being gradually strangled in public fashion by the likes of her interior minister Horst Seehofer, who is making time between sessions to take the carpet from under his boss and booby trap it for good measure. To that end, he has offered to hand in his resignation papers. Across a slew of countries, the fronts against unwanted arrivals are being barbed, the doors bolted, the paper processes being tightened. "What is being witnessed, on a global scale, is an attempt to abrogate, or at the very least negate, the letter of the Refugee Convention. It was arguably a measure that was pioneered in Australia." On being pressed by Italy's new government to take the issue of refugees more seriously (disrupting it, rather than healing it), the EU met in an attempt to iron out a united front that seemed more disunited than ever. The resulting agreement on refugees and migrants does little to resolve the humanitarian crisis, using such terms as 'regional disembarkation platforms' and 'controlled centres'. What is being witnessed, on a global scale, is an attempt to abrogate, or at the very least negate, the letter of the Refugee Convention. It was arguably a measure that was pioneered in Australia, and then exported with invidious effect to other countries and continents. The idea of the Convention was, originally, to protect those dislocated by war, given the unflattering title of displaced persons. The modern refugee, deemed pestilential, is to be contained like the plague. Mark the crosses on homes, bolt the doors and hope for the worst; the modern refugee is both curse for the populace he or she arrives to, and a tainted blessing for political opportunists. Australia's refugee intake in 2015-16 was around 17,000. As far as I know, the Australian government hasn't reduced that number, so there is no "push" against refugees here. Neither in the U.S. But there are some 65 million refugees in the world. By their feet and boats, they demonstrate a preference to come to: the USA, Australia, Britain, Germany and a couple of other countries. If they were all accepted and divided up, that would be about 9 million per destination. On top of that, doubtless another 60 odd million would then line up. Rinse and repeat, until those Western economies collapse. Why can't the bleeding hearts offer a feasible solution, instead of just virtue-signalling? There are refugees in flight for their lives without choice, money, possessions or daily sustenance, rather like Joseph and Mary and their child, Jesus. They flee with those they love most, their family, without any known destination. Then there are those, typified by the vast majority of recent refugees in Europe, who pay to be refugees, don't flee with their families, deliberately choose a destination and are in the main male, unmarried and under 30 years of age. A practical solution would be to look after the families with nothing first and repatriate those who have chosen and paid to migrate to a perceived better life. This latter type of "refugee" compounds the problems for those who have fled their homes without choice. The current "bleeding heart" approach in Europe simply hasn't worked which is precisely why the European nations are demanding a different approach. I must say I am somewhat puzzled whenever I read the term 'bleeding heart'. I would presume we all have a bleeding heart and would suffer somewhat without it. Binoy points to a situation of utter horror - not the situation of so many 'displaced' people, but the growing signs of savage determination, on the part of wealthy and secure nations, not to accept responsibility for a humane response. Pointing virtuously to the small number of economic migrants among the refugees, ignoring the fact of the huge number of people being received by poorer countries, exaggerating or even lying about the effects of refugees on our own countries - all symptoms of the ancient mantra "My children first - and last". No mention is made of the social problems which are created by an influx of culturally different people who don't or won't assimilate, however some do and are welcome to all the help they need. Why is there no mention of the countries they come from and a concerted push to improve these countries. Nobody seems to mention the records of appalling human rights abuses, yet are happy to denigrate the countries who do try to help but at the same time need to look after their own citizens. Unfortunately, at present, the Australian people (both taxpayers and the millions of non-taxpayers) simply can no longer afford to provide the astronomical funding outlays to supply the infrastructure and services for more than 130,000 non-refugee migrants that arrive in Australia each year. From both a moral and economic perspective, everybody in Australia would be a lot better off if we doubled our intake of genuine refugees and halved our non-refugee intake, because the current Australian immigration policies and practices are simply unsustainable. I have to strongly disagree with you HH. We have solved the refugee problem ie illegal arrival by boat, by threatening concentration camp style conditions on Nauru/Manus to any refugee prepared to take the risk . The refugees in central America and North Africa must be absolutely desperate to undertake such dangerous journeys Now we are seeing similar type solutions in Europe and America . What really bugs me is that many of these refugees are fleeing wars caused by economic and ecological disasters , sadly a result of neo-colonial polices dating back to the start of last century when the European powers divided up the so called undeveloped world among themselves to exploit their resources with scant regard for the indigenous population's wellbeing . Sadly colonialism has left a legacy of war, poverty and economic disasters which are now coming home to bite us on the bum! Having been to some of these countries myself in recent decades, following my own deployment to Vietnam during the War in 1970-71 (which was as we now know, was totally immoral) I have seen at first hand the poverty that has resulted from western imperialism. As a Christian I strongly believe in social justice .We have a moral responsibility to right the wrongs of the past. Further, I believe we have to assist these countries to develop their economies and resources so that their people can at least have a comfortable life style. If that means we have to cut back on our exploitive, consumeristic lifestyle-then so be it! I sincerely hope your heart is not bleeding, Tom. You would be a very sick boy indeed if it were! I imagine the term "bleeding heart" may have its origins in those gruesome depictions of Jesus' heart bleeding because of his heart-rending compassion or because of the injury to it by those sinners who broke his heart. This is a very complex issue. However, the hatred towards refugees that the Australian, and many other governments preach, is repulsive to me. Refugees flee their countries in a desperate bid to live. Why does no one ever mentioned that Australiahas participated enthusiastically in the wars that have created so many refugees in our world? We claim to be a Christian nation but how do we demonstrate our Christianity and what’s happened to treating all people humanely? Australia can do little against the horrendous factors that push people to leave their homeland. Their governments are well nigh impossible to negotiate with, either on a bilateral basis or in a multinational situation. Likewise Australia doesn't want to make an unattractive pull country, otherwise we couldn't attract the migrants & visitors on which our economy depends. So we settle for the demonizing of the desperate, the criminalising of anyone who aids & abets them, & making a punitive example of the few who manage to make landfall. Just what sort of work is DFAT doing to create a more humane foreign policy? Gavin: "We have solved the refugee problem ie illegal arrival by boat, by threatening concentration camp style conditions on Nauru/Manus to any refugee prepared to take the risk." But this is completely false isn't it? You need to get real. No Jew/gypsy/homosexual in a Nazi concentration camp had adequate food and shelter and medical attention among other things, plus the choice to leave the camp and move from there to another destination. No-one is being tortured, or executed. And no-one in the Nauru/Manus Is centres is forced to work. Whatever real difficulties the asylum seekers are undergoing, the fatuous equation of their situation with "concentration camps" only serves to increase the impression of a massive beat-up, doing the inmates no favours. To put it bluntly: millions, perhaps billions, of the world today would trade their place for the lifestyle of the Manus or Nauru camps. To say nothing of the world's population across human history. In other words, however worse off they are than you or I, they are far better off than billions in the world today and most people in history. And they can move out, if they so choose! Again : concrete solutions, please, not virtue signalling. There is far too much moral posturing around the issue of immigration/refugees. A number of studies have shown that it is far cheaper to help people in their own countries than to help them in Western nations. Recently Paul Collier who is Professor of Economics and Director of the Centre for the Study of African Economies at Oxford University wrote: “We spend 135 dollars for every person who shows up here, compared to one dollar for every person that we help in their own region. Those staying home are often much weaker than the ones who have the resources to get to Europe…Mass poverty has to be tackled, but the only way it can be done is for poor countries to catch up with the rich ones. There are ways in which we can help that process, but encouraging the mass emigration of their most enterprising young people is not one of them.” Good advice! But mass poverty won’t be beaten by introducing socialist policies that have bankrupted once-rich countries like Venezuela and caused a flood of one million refugees into Columbia alone. And these socialists are the same people advocating open borders which will destroy Western nations as well. It is ironic and nonsensical that as our government tightens its treatment of asylum seekers, they reduce our overseas aid. It seems we should be working at both ends - supporting development and justice in overseas countries and tresponding to those who are displaced by war and oppression. The late Archbishop, Helder Camara spoke prophetically when he said we need to work to heal people suffering from injustice but also to heal structures. If as it seems Australia is leading the world in harsh and inhuman treatment of refugees and asylum seekers why can't we redeem ourselves and start leading the world in taking more positive steps to heal the structures which perpetrate the growing number of displaced people - those in search of a secure home - surely a fundamental human right. The use of the term "bleeding heart' is obviously a cynical ploy by misanthropes who think anyone claiming asylum is a fraud and should simply "go back to where they cam from". I'm astounded that my comments are so often "moderated" and yet certian old codgers commenting can get away with their propaganda. When was the last time someone who uses the term "bleeding heart" has visited a region of the world where refugees are coming from? How about ES show a bit of balance and give me a right of reply? I was wrong, on two counts! In fact, Australia has, apparently, increased its refugee intake - not just maintained it, as I stated above. So no "push" against refugees here. But more importantly: contrary to another of my assertions above, I acknowledge on further inspection that the U.S. under Trump has dramatically REDUCED its intake of refugees from 85,000 under Obama's last full year (2016) to around 54,000 in 2017. So Dr Kampmark is definitely right there, and with apologies I stand corrected (by myself! - where are the fact-checkers around here?) I think that the argument for Trump's pull back from the (IMO reckless) Obama policy is at least arguably justifiable, and point out that his 2017 reduction means the year-on-year average annual U.S. refugee intake of the last decade – about 60,000 – remains unchanged, shock, horror. So not really a “push” at all, in the longer term – yet. Moreover, IMO, the open borders policy seemingly advocated by Dr Kampmark and other bleeding hearts amounts to nothing short of national suicide, doing no-one any good in the long run. But those are separate issues. I was wrong on a substantive point.